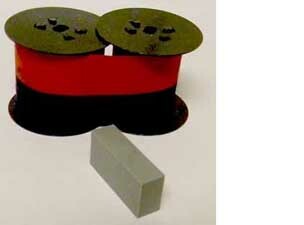 Lathem stamp pad - the platen, and cotton Lathem black and red ribbon, the 1-2 combination. If the clock is printing terribly, tip up the clock movement, pull the ribbon aside. If you see a crumbling piece of gray plastic, then that is the problem. It's easy to replace, we can send you a link on how to do it. You will need a ribbon, a platen, and 15 minutes of your time (probably less). These are the Lathem parts that you need to fix this problem.